as we know in previous posting about main construction of mold, there was pin in leader component, this pin will support main construction and cavity plate (3) from deflection and guide the cavity part and core part when mold closing. 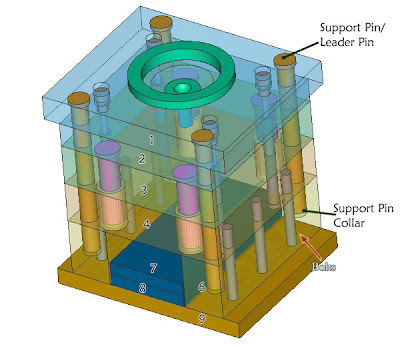 here the picture of support pin or leader pin in 3 plate mold type. 1. 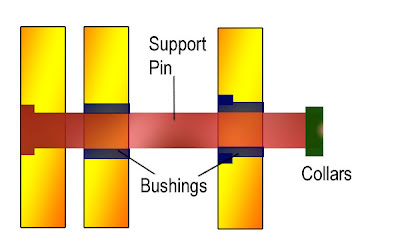 Support pin it self, some mold engineer call support pin by leader pin or main support pin. 2. Bushings, how much bushing that we needed depend on type of mold base, for example for 3 plate type of mold base we need at least 2 bushings, one in stripper plate (2) and one another in cavity plate (3). bushings prevent support pin have direct contact with mold base plate, becouse mold base plate usually use more soft material and support pin is harder material, it can cause scratch if use in long time and mass production, bushings always use harder material with good tolerance to support pin. so the other advantage is mold can be opened and closed with precision. and it can use in mass production mold. 3. Collar, it to prevent plate of mold out from leader pin when puller bolt broken or others accident possibility, with collar give the mold construction more safe. 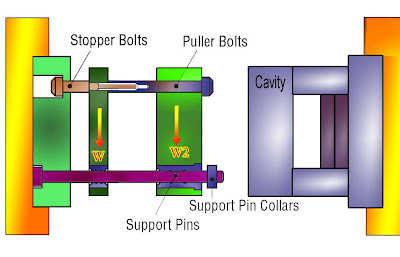 to calculate more complex and precision add the force from support pin weight, collars weight, and 3 dimensional calculation methods. then by calculation we can get the fine radius, after calculation I, maximum deflection is about 0.05 mm, more than 50 micro millimeter, use more large radius of support pin. or place more precision guide, like block guide, linear guide and others between cavity plate and core plate, it should be more precision when mold in closed position.